"Welcome to the real world. "The planet has been taken over by robots and have been using humans as batteries. It was one man who knew there was someone who could save the world, Morpheus. He spent his whole life searching for this hero and now you can look just like him with this jacket and glasses. Its time to enter a digital world to save the human race from robot overlords! 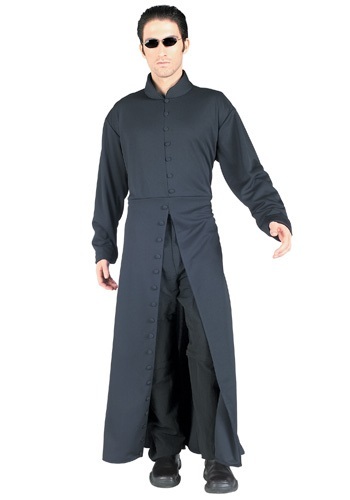 You'll be all set to sign in to the Matrix when you wear this Neo costume. Impress everyone with your ability to dodge objects being thrown at you and your kung fu skills. Just keep an eye out for that dastardly Mr. Smith! "Please Neo, you have to trust me. "It's time to take on the robots who took over the world! 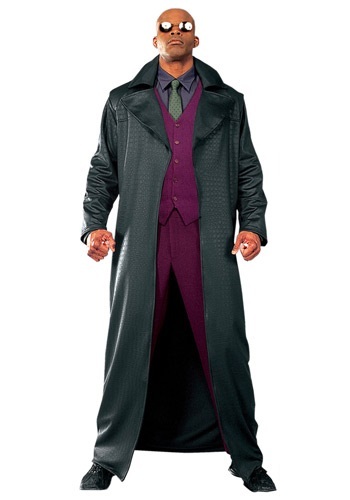 Become the toughest girl to fight the Mr. Smith's when you wear this Trinity costume straight from the Matrix movies. Pair this with some of our toy guns and you'll be ready to save the human race. Fighting the war against the machines in the Matrix is a cinch when you wear this Plus Size Cyberspace Fighter Costume! Add a pair of our aviatoar sunglasses to your order and you can look just like Neo from the Matrix movies.